When it came to getting the perfect Valentine's Day gift for Pink, Carey Hartmade it easy for himself. At the MusiCares 2019 Person of the Year event honoring Dolly Parton on Friday, Pink revealed to E! News' Justin Sylvester that she basically picked out her own gift for the holiday, which is this Thursday. "We went to a store the other day and I was like, 'That's a nice ring, babe,'" she said. "He was like, 'I'll get it for you for Valentine's Day.' I was like, 'Wow, you really just wanna be done, don't you?' So I took the ring." She said she did not think the two had plans for Valentine's Day, adding, "We're packing for a tour." Pink's Beautiful Trauma world tour begins on March 1 in Fort Lauderdale, Florida. Pink and Carey celebrated their 13th wedding anniversary last month. They are parents to two children—7-year-old daughter Willow and 2-year-old son Jameson. Pink's family accompanied her as she received a star on the Hollywood Walk of Fame earlier this week. 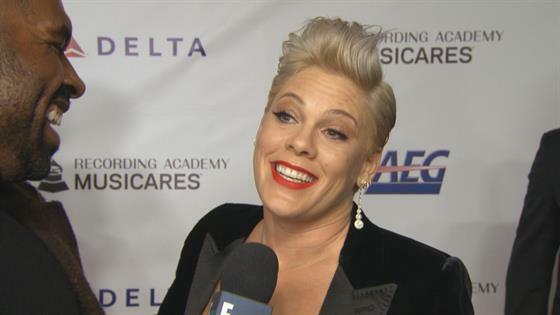 Pink told Ellen DeGeneres, who praised her in a speech at the ceremony, that Carey gave her flowers and that Willow wrote her a note, which threw some shade at Justin Bieber. Carey is a huge supporter of his wife, who is nominated for a Grammy Award for the 20th time at Sunday's 2019 Grammys. The singer, who has three Grammys under her belt, told Ellen, "Every time I lose, Carey makes me a tinfoil Grammy. And so, this will be my 17th tinfoil Grammy on Sunday."